Toshiba Electronic Devices & Storage Corporation has announced the development of “TaRF10,” a next generation TarfSOI (Toshiba advanced RF SOI) process optimized for low-noise amplifiers (LNAs) in smartphone applications. In recent years, the increasing speed of mobile data communication has expanded use of RF switches and filters in the analog front end of mobile devices. The resulting increase in signal loss between antenna and receiver circuit has degraded receiver sensitivity, and focused attention on LNAs with a low noise figure (NF) as a means to compensate for signal loss and improve the integrity of the received signal. Toshiba has used its new TaRF10 process to develop a prototype LNA with an outstanding noise figure of 0.72 dB and a gain of 16.9 dB at a frequency of 1.8 GHz. Mobile devices use many RF switches and LNAs in the receiver circuit, creating a need to reduce circuit size in order to reduce board area utilization. 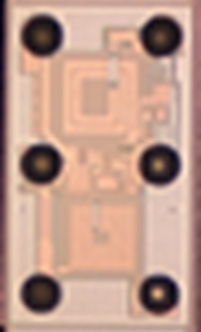 Current LNAs typically use silicon-germanium-carbon (SiGe:C) bipolar transistors, and it has been difficult to integrate LNAs and RF switches fabricated with different processes on the same chip. The new TaRF10 process can integrate LNAs, control circuits and RF switches on a single chip, as it is highly compatible with the TaRF8 and TaRF9 processes for RF switches, which have outstanding RF characteristics. TaRF9 realizes lower insertion loss and signal distortion than TaRF8. Using this new process Toshiba plans to bring to market LNAs with integrated RF switches. Toshiba Electronic Devices & Storage has developed RF ICs utilizing its subsidiary, Japan Semiconductor Corporation to apply the latest SOI-CMOS technology, and by handling all aspects of the production flow, from RF process technology development to the design and manufacturing, secured a rapid products launch.